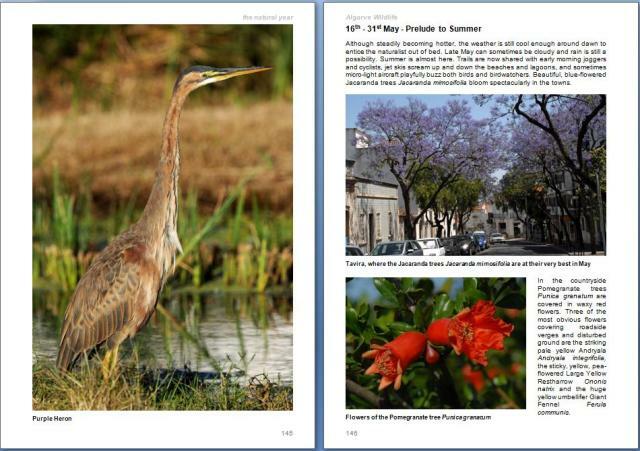 First published in 2009, Algarve Wildlife - the natural year has been one of the most successful books about the region, and now First Nature is proud to present a fully revised and substantially enlarged second edition. "...an excellent book for all those who come to the Algarve for the first time and are interested in seeing beyond the walls of the resort or the boundaries of a pleasant beach. It is also recommended for those who already know the region but feel they might be losing a good part of it. They are right: this is the book that will help them to notice and to appreciate the immensity of detail that composes the Algarve nature they seek to know better." Special Offer: £18-50 + P&P - a saving of £4 on RRP, and for a single P&P charge of just £2-95 per order, books are sent by parcel post (UK addresses only). Post and Packing charge to other Eurozone Countries is £7 - single copy orders only. Post and Packing charge to destinations outside Europe is £10-50 - single copy orders only. Since the launch of the first edition, in November 2009, this has been the Algarve's bestselling wildlife book. This beautifully illustrated hardback book about the wildlife, ecology and scenic beauty of the Algarve is an authoritative wildlife diary of 288 pages and more than 600 large colour photographs. Written and illustrated by local experts drawing on decades of meticulous observation, it provides fortnightly guidance on what to see and where. 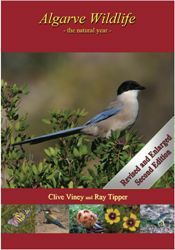 Packed with a wealth of wildlife, wildflower and fungi information, fascinating facts for Algarve visitors and residents alike, Algarve Wildlife is written in clear language accessible to all readers, without losing the scientific accuracy sought by botanists, birdwatchers and other nature-lovers. Clive has written many articles and provided natural history input to Lonely Planet guides. Closely associated with the Algarve since 1988 and as a member of the Sociedade Portuguesa para o Estudo das Aves he has participated in most of their major surveying projects. He gives lectures on the birdlife of the Algarve, introducing visitors and residents to the profusion of wildlife in the region. Ray Tipper began his birding on the North Kent Marshes at the age of eleven. He left Britain in 1973 spending most of the next 22 years in Hong Kong. As a trustee of WWF he was intimately involved with its renowned Mai Po Marshes Nature Reserve. It was in Hong Kong that Ray turned to bird photography, which quickly became his major interest. Having gained associateship of the Royal Photographic Society in 1990, his photographs appear in journals and books throughout the world. Ray leads specialist birdwatching tours all over the world and since 1997 has led some 80 tours in Europe, North and Central America, Asia and Madagascar. He spends much of his time in the Algarve, where his intimate knowledge of its birds has been recognised by his appointment as a member of the Portuguese Rarities Committee.